This is a question I get all the time when I’m talking to people outside of the office about what I do. Typically, when people are in the office, they already know the answer and that’s why they have come to see me. But, outside the office, people aren’t that familiar with the process, especially if they’ve never had to go through it upon the passing of a loved one. The process I’m speaking of is called the probate process and I’ve written about it before on my blog. I’ve written about interesting movies that have estate planning lessons in them and I’ve also written about celebrities who have either done well in their estate planning or who have made mistakes about estate planning like so many people do. The answer to the question of does a Will have to be probated in Georgia is both a “yes” and a “no.” The reason for this is I’ve realized over time that many people are confused about the probate process in general, what it involves, and why you want your family to avoid it in the first place !! The probate process is the court-supervised distribution of your assets upon your passing. Sometimes, this supervision can be avoided and I’ll explain that a bit more later in this article. Some people believe that the Probate Court only becomes involved if you have a Last Will and Testament. But, this isn’t true. The Probate Court also becomes involved if you don’t have a Last Will and Testament. The key isn’t whether you have a Will or not, it’s whether you have probate assets or not. Probate assets are assets that are usually reviewed by the Court before distribution. These include things like real estate, interests in real estate such as gas or oil rights, certificates of deposit, certain investment accounts, etc. I use the word “usually” because there are ways you can “title” assets so that they avoid the Probate Court, but most people don’t title their assets correctly. Hence, the reason the Probate Court exists. There are certain assets that don’t have to go through the probate process. For example, IRAs do not have to go through the probate process. This is because you can name a beneficiary to the IRA. Typically, things that have beneficiary designations do not go through the probate process. Other things that allow a beneficiary designation include things like insurance policies and 401k’s. So, when you pass away, whoever you have listed as the beneficiary of the policy will receive the proceeds of the policy without having to go through the Probate Court. So, upon your passing, your family will review your assets, how you have them titled, and will then make a decision about what kind of trip they will make to the Probate Court (assuming you haven’t taken steps to avoid the probate process). File the Will or Probate the Will? That is the question. There is a difference between filing the Will with the Probate Court and probating the Will. In general, the Will should always be filed, but the Will doesn’t always need to be probated. For example, if you only have non-probate assets, it’s probably necessary to only file the Will. However, if you have any probate assets, then you’ll probably need to file the Will and have it probated. Why is it important to at least file the Will? Because it could be a criminal act if you know where an original Will is or have the original Will in your possession and not at least file it with the Probate Court once someone passes. In Georgia, the Probate Judge could issue sanctions of fines and jail time if the Will is not delivered to the Court. It is classified as a misdemeanor with a fine up to $500 and a jail sentence not to exceed 20 days. That’s reason enough to at least file the Will. What are the situations where you might only file the Will and not probate it? I have to give you a warning here because I can’t count the number of times families have been in my office needing help with a Probate matter and they’ve assumed that the assets were titled properly. Just because a home is owned jointly doesn’t mean that it’s titled properly to avoid the probate process. Additionally, you might need to check the beneficiary designations on life insurance policies and the like because there may be some deficiency with the designation. If so, the Probate Court may need to get involved. What happens if I need to probate the Will? If a person were to say to me that they need to probate a Will, my first response is “I’m sorry to hear that.” The probate process isn’t something that families look forward to and they never end the probate process saying they were glad to go through it. It’s just something that people would prefer to avoid and I can’t blame them. That’s because the probate process can be a costly and time-consuming process. Don’t get me wrong, estate planning has costs of its own, but an ounce of prevention is worth a pound of cure. On average, the probate process lasts 6 to 12 months in Georgia. That’s an average. Sometimes it’s less, but sometimes it’s more. Going through the probate process is a bit like Forrest Gump’s feeling on life. You never know what you’re going to get. If the Will has been filed and an Executor has been appointed by the Probate Court, then a document called Letters Testamentary will be issued by the Court. This is the document that gives you, as the Executor, the authority to handle the business of the estate. Gather and collect all of the assets of the estate. Determine what debts are owed out of the estate. This step includes publishing what is called a Creditor’s Notice in the local newspaper. Additionally, this step includes paying all of the debts of the estate in a pre-determined order of priority. Next, if it is necessary, you may or must sell or liquidate assets of the estate. In some cases, this is permitted and in some it is required. You may need to file income, estate, or other tax returns for the estate. If there is anything left over at this point, you may need to distribute the remaining estate property as required by the Last Will and Testament. All along this process, you may need to file Inventory Reports with the Court or an Annual Return or any other report that may be required by the Court. Finally, after you’ve completed all of the necessary work, it may be time to close the estate. You have to file another Petition with the Court requesting for a discharge of your duties and to close the estate. Here, the Court will do a final review of the estate to make sure everything was done correctly. As you can see, this can be costly and time-consuming. I would recommend that your family avoid it if they can, but it requires you to take steps now. Remember, a Last Will and Testament isn’t designed to avoid the probate process. Instead, it’s designed to take you through it. How can I avoid this process for my family and loved ones? Name a beneficiary – the probate process determines who gets what when there is no beneficiary designation. So, make sure those financial instruments that can have a beneficiary designation actually have one. Also, here’s a pro-tip: Never name a minor child as the beneficiary of an insurance policy. There are better ways to get funds to the minor child. If you name a minor child as the beneficiary of a policy, the Probate Court may need to appoint a Guardian for the child and then the Guardian will need to post a surety bond with the Probate Court in order to manage the proceeds until the minor reaches 18. This is true even if the Guardian is the parent of the child. Avoid this at all costs if you can by not naming a minor child as the beneficiary of a policy. Create and fund a Revocable Living Trust – this is a great addition to a Last Will and Testament and is being used more and more these days to avoid the probate process. The Trust will own your property, yet you remain in charge of all decisions regarding your assets until your death. After you pass away, your successor Trustee (the person you’ve named to take care of your affairs after you pass away), manages your assets pursuant to your instructions. This works really well in conjunction with an experienced estate planning attorney. Own property jointly – the probate process can be avoided if the property you own is held jointly with rights of survivorship. There are different ways you can own property jointly and Georgia doesn’t allow all of them. As an example, Georgia doesn’t allow Tenancy by its Entirety. Georgia also doesn’t allow what we know as community property. Keep in mind, as I mentioned above, just because your name is on the deed doesn’t mean it’s the proper way to avoid probate. 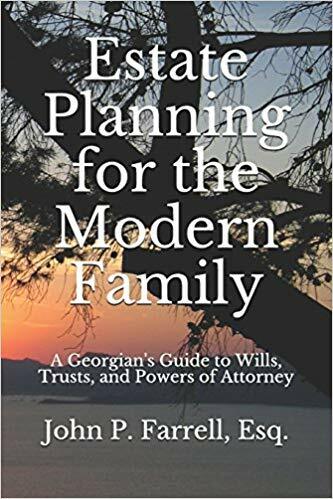 So, in conclusion and to summarize, the question is does a Will have to be probated in Georgia. The answer is “yes” and “no.” You should absolutely file the Will if you have it. Remember, you can be charged with a misdemeanor if you willfully withhold a Will from the Probate Court. But, the Will may not need to be probated. This will depend on whether there are any probate assets. If you have real estate, such as a home, then the answer is most-likely “yes.” But, it could be “no” depending on how the property is titled. Again, you want for your family to be able to avoid the probate process if they can. So, take steps to give your family the peace of mind knowing they won’t have to visit the Probate Court when you’re gone. It could be the best inheritance you leave them.